According to the teachings of the Yungdrung Bön, a human life is rare and precious. Because of this, there are spiritual practices with the purpose of healing any damage to the lifespan and for removing any obstacles that could interfere with the complete fulfillment of the lifespan of an individual. One of the most common practices to attain these results is The Practice of the King of Longevity, Tséwang Rikdzin’s Supreme Collection that was received upon Jarima. Commonly referred to as the Tséwang Jarima. Within this text are rituals for healing as well as instructions for practicing with the King of Longevity, Tséwang Rikdzin. This deity holds a Tibetan letter AH which symbolizes his realization of emptiness and the highest of all teachings regarding absolute reality. 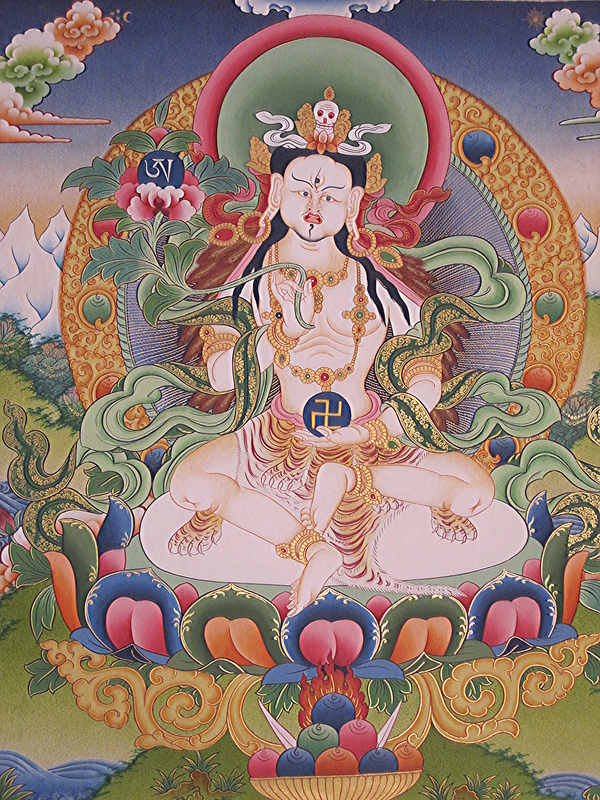 He also holds the symbol of a yungdrung which represents changelessness and ceaselessness. In this context, these qualities are associated with his power over the lifespan. Tséwang Rikdzin was an historical person. He was the son of Zhang Zhung Drenpa Namkha and his twin brother was Pema Tongdrol. Although an emanation with great knowledge and realization at his birth, Tséwang Rikdzin received many teachings and heart instructions from his father. In addition to composing many ritual texts in order to alleviate the suffering of sentient beings, he is also an important lineage master of the highest teachings, called Dzogchen, The Great Perfection. The Tséwang Jarima text contains a long life mantra that is recited by Yungdrung Bön practitioners throughout the world. During the week-long longevity retreat, this mantra is recited 100,000 or more times in order to obtain the power and energy of the mantra and the yidam, Tséwang Rikdzin. Posted on August 2, 2015, in Five Elements, Prayer and Ritual, Tibetan Lamas, Uncategorized. Bookmark the permalink. Leave a comment.